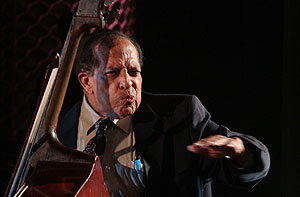 In the formidable legacy of Cuban music, no one is more important than quintessential bassist, Israel ‘Cachao’ López. Born in 1918 into a family of highly respected, classically trained musicians and maestros, he became their most celebrated progeny. Raised in Havana in the same house where legendary patriot, poet and revolutionary Jose Martí was born, Cachao would revolutionize the heart of Cuban music. Few, if any, 20th century musicians or composers have had the impact in their respective fields as Cachao. He is widely known as a pioneer in the concept of the exciting descarga Cubana (Cuban jam session) that brought a high level of spontaneous improvisation into a 150-year-old tradition of Cuban dance music, and directed much attention to the rhythm section of bass, tumbadoras (conga drums), timbales, bongos, and guiro (gourd scraper). But his innovations in the Cuban dance music known as danzón, particularly within the charanga format (strings, flute, acoustic piano, contrabass, and percussion) are what he considers most important and where his largest contributions can be felt. By the latter half of the 1930s, before his 20th birthday, he and his older brother Orestes were playing and composing for La Orquesta Maravilla de Fernando Collazo, one of the most popular and professional charanga orchestras in Havana. Towards the end of the decade, the orchestra continued under the directorship of flautist, Antonio Arcaño, becoming one of the most influential charangas of all time. 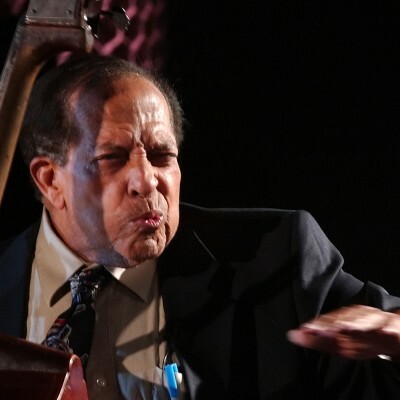 While playing bass in this orchestra (and simultaneously holding down the principal bass chair in the Havana Symphony), Cachao and Orestes developed the danzón de nuevo ritmo, precursor of the world-renowned mambo that was to become an international phenomenon almost a decade later. Today those innovations are as relevant as ever, providing much of the basis for contemporary Latin Jazz and Salsa. The role of the bass in Cuban music is paramount. The best bassists in this genre must have impeccable timing, intonation, and harmonic/melodic sense. Cachao’s position at the top of the hierarchy was honed from incessant classical conservatory training and experience in the theater, opera, and 30 years in the Havana Symphony under the direction of all the legendary conductors of the day from Europe and the New World. He accompanied Caruso, Tebaldi and Gardel among hosts of others. Add to this his love of the popular Afro-Cuban forms such as son and rumba that he also played extensively from the beginning, and you begin to see why he is the standard bearer. Throughout history, there have been great composers, ingenious arrangers, virtuoso instrumentalists, highly respected classical players, and beloved interpreters of popular music forms. But you’ll have a difficult time coming up with another name besides that of Israel ‘Cachao’ López that can rightfully claim all these accolades. This film is a glimpse into maestro Cachao’s music, world and legacy, revealing the warmth, humor and humility that have been his trademark for nine decades. He owned the 20th century and amazingly, he hit the 21st running, releasing several CDs and touring in Europe, South America, and the US since the turn of this century. He will undoubtedly go down in history as one of the greatest artists of all time. Long live Papa Mambo—Israel López—CACHAO!! !